Festival of Shopping and Fun with 3 days' worth of fantastic experiences • BTC d.d. This is the first time that the Festival of Shopping and Fun, which draws about 170,000 visitors every autumn and spring, will last for three days straight. Shops, bars, and restaurants in the entire BTC City area will once again offer their visitors special benefits and attractive discounts, which apply on Friday and Saturday (May 19th and 20th) in the extended opening hours between 9 a.m. and 9 p.m., and on Sunday (May 21st) from 9 a.m. until 3 p.m. Bargain purchases will be accompanied by a side programme focusing on street trends and culinary delights. Activities will take place simultaneously at multiple venues: the main square between Hall A and the BTC City Market (i.e., the main venue), the Adrenaline Park next to Atlantis Water Park, the south side of the BTC City Market, the renovated Trg mladih square, Hall A, the car park in front of Sports Centre Millenium, and in front of the Mass store. Shopping and entertainment will be even more exciting in light of a treasure hunt organised in collaboration with the Addiko bank. The treasure hunt will conclude on Sunday, when the lucky winner of the prize draw will receive EUR 5,000 worth of BTC City gift cards. On Friday, Saturday, and Sunday, visitors can witness the creation of street graffiti in BTC City’s main square. A true street atmosphere will be brought to life on Saturday and Sunday, with street fashion trends presented by the Libero Dance Center and open-air live street music performed by Nipke. On Friday, the Adrenaline Park next to Atlantis Water Park will host the Festival of Coexistence, with sports competitions and an animation programme for families and children. On Saturday and Sunday, the main venue will come to life with Baby Center’s “Štorkovo igrišče” (“Stork’s playground”), where our youngest will dance and move, compete, sing, and exercise their young brains. On Saturday and Sunday, fans of sports will be able to go for a test ride with a kayak or a sup at the main venue next to the Slovenian Kayak Association, or attend the “Igrajmo tenis!” (“Let’s play tennis!”) tournament in front of Sport Centre Millenium, which will feature young Slovenian tennis players. On Saturday, the Trg mladih square will see a presentation of eco-friendly vehicles, as part of which visitors will be able to test out different electric vehicles. Fans of good cuisine will be spoiled by special culinary delights, courtesy of selected vendors visitors can identify by consulting the special recommendation flyer “Okusni Bluz – Food Bluz Priporoča”. The BTC Market’s south side will be busy with vigorous activity. On Saturday, special guest and master of the culinary arts Alma Rekić will prepare a dessert that visitors can taste for free, and on Sunday we will receive a visit by a couple of candidates from a famous TV cooking show, Sašo Bertoncelj, Sašo Šketa, and Sašo Weilgoni. Meanwhile, coffee lovers can enjoy a free cup of Turkish coffee from the biggest Bosnian cezve in the world. 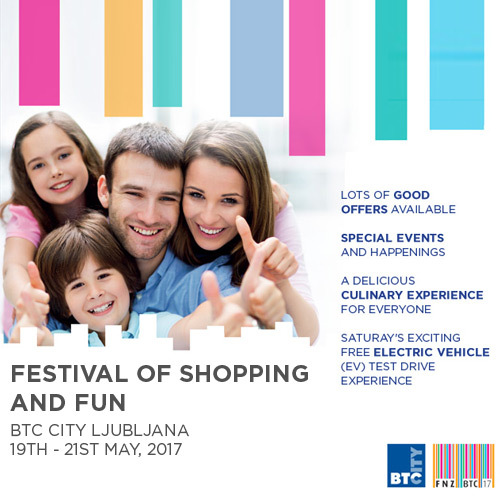 The entire programme of the Festival of Shopping and Fun in BTC City Ljubljana is available at www.btc-city.com/fnz (in Slovene only). The website also features a list of discounts and benefits. The festival will also be taken to other BTC Cities. It will take place on May 19th and 20th in BTC City Novo mesto, and a week later, on May 27th, in BTC City Murska Sobota. Additional information about the programme is available at www.btc-city.com/fnz (in Slovene only).